With all the hype that swallows up the NHL’s Entry Draft, it’s easy to forget the player who wasn’t quite good enough, in the scouts’ eyes at least, to be chosen first overall. This short series will be looking that the other guy; the fella who went second. We’ve already looked at Eric Staal, Tom Lysiak, Jason Spezza and Dave Babych, and as there’re 8 days to go until Christmas, here’s #8 in the 4th Line Podcast’s top 12 2nd Overall Picks. As is generally the rule with high draft picks in the first round; the team that makes the pick probably just came off a stinker of a season. The 1987/88 season for the Vancouver Canucks was no exception. Finishing with just 59 points, the Canucks were second last in the league and missed the playoffs for the second year running. Only the Minnesota North Stars fared worse, with just 51 points. The North Stars naturally had the first overall pick and used it to draft some fella named Michael from Michigan. The Canucks however jumped on a young winger from the Medicine Hat Tigers. Likely influenced by the 1.64 point per game season that Linden had just come off, and unsurprisingly Linden and the Canucks hit things off immediately. His first point was registered in just his fourth NHL game, assisting a Petri Skriko goal in a 6-2 win over the Edmonton Oilers. Linden’s first (of 375) NHL goal was scored on the power play in just his his seventh game with the team. In each of his first six seasons in Vancouver, Linden hadn’t scored less than at least 51 points. On June 14th, 1994 the Canucks were playing game seven in the final series of the Stanley Cup Finals against the New York Rangers. Vancouver went on to lose the game 3-2, sniped by a Mark Messier power play goal in the second period. The Canucks may have lost the Finals, but both of Vancouver’s goals in the final were scored by Linden. In February 1998, Linden’s (first) stint with the team that drafted him came to an end under somewhat acrimonious circumstances. 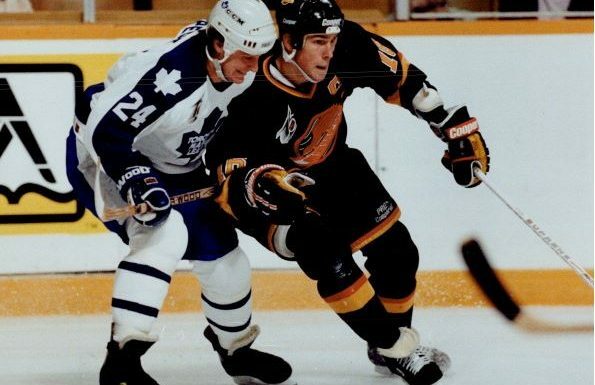 The aforementioned Mark Messier joined the Canucks, the franchise was already under a cloud as the team’s GM and the head coach had already been fired. The changes to the team dynamic were not harmonious and Linden and Messier could not get along. The six-time Stanley Cup winner stayed and the no-time Stanley Cup winner Linden was traded to the New York Islanders. Where is Trevor Linden now? The Islanders were offered a first round draft pick for Linden by the Montreal Canadiens, but that trade was short lived. Linden played just over 100 games for the Habs before being traded to the Washington Capitals. After 16 games and a short playoff run, Carl’s former bandwagon team parted ways with Linden, with the story going full circle, Linden was traded back the Vancouver Canucks. After a further five and half seasons in Vancouver, Linden retired from hockey. The Canucks recognised his impact on the team by hanging his #16 jersey number from the rafters. Today Linden is the Canucks’ President of Hockey Operations. He’s also been president of the NHL’s Player Association and has been awarded Order of British Columbia and the Order of Canada. Did the North Stars miss a trick by drafting Mike Modano instead of Linden? Of course not. Modano is one of the best human beings to ever grace an ice rink with his presence. I’ve heard mixed things about Modano’s beer though. This takes nothing away from Linden, who in a different season could easily have been a number one draft pick. Tomorrow? It’s only number seven!